A new experience for orientating within large spaces using a mobile device. All in one app for your mobile. Navigate using images of the actual space. Navigate without requiring access to the internet. Intuitive, accessible, clear, dynamic and personal. The core concept of the application, especially recommended for Health and Learning Centres, Hospitals, Universities, Campuses, etc. Based on the starting point and destination selected, the number of routes generated can provide various points of interest. As well as the standard destination selection functions of the basic version, it also allows product searches with different suggestions and incorporates an advertisement module, via which promotional banners can be displayed during the journey, and whose content can be managed and changed according to each operator. This version incorporates the ‘Analytics' module, with a multitude of data reported on the application's use. The version for exhibition halls and department stores is aimed at spaces in which the layout of aisles and routes is regularly changed. This version works using geolocation and adapts to the different planning and layout changes that these types of facilities require daily. the mobile signage app that is very simple to use and works without the need to be connected to a WiFi network, with a very clear interface that accompanies you step by step via images of the actual space whilst following the arrows to whichever destination you have selected. A cross between the standard browser and Street View, but designed for indoor use as an additional tool to complement existing signage; easy to manage and maintain whilst enhancing the user experience in buildings with complex layouts. It has been shown in studies of digital signage solutions that the use of floor plans as a means of orientation presents a difficult challenge for a significant number of users, and that the more effective methods make use of visual references from the things around us that we use to help find our way. Based on this concept, Signes APP Eyedog sequences images of the actual space in order of the shortest route, or via a route recommended by the administrator for the selected destination, incorporating visual information such as directional arrows and symbols that are presented in a clear and easy to understand format commonly used in most interior signage. This system works for long and complex routes, even those that involve changing floors or levels, without having to memorise routes or make sense of interior signage. The digital signage application, which can be downloaded from the App Store or Google Play platforms, allows you to preview your desired route from home. A 3G or WiFi connection is not required to run it once downloaded, making it an ideal digital signage solution in buildings with limited data coverage, such as hospitals and museums for example, thus allowing multiple users to access the app simultaneously without the risk of network overload or connection loss. It is the technological tool that offers a personalised information solution for each user without relying on standard fixed digital signage terminals. 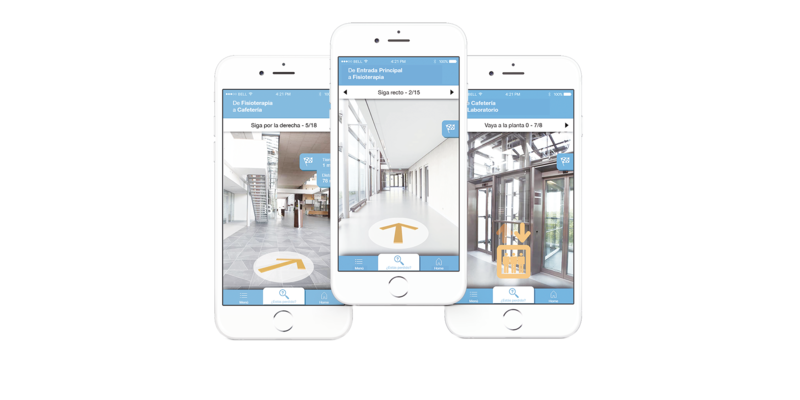 The user experience is always a key feature in Signes | Eyedog Indoor Navigation. If users cannot find their way around a wayfinding mobile app, they certainly won’t be able to find their way around the building. We believe that technology is not an end in itself, but rather an instrument that equips visitors with the best means to enjoy the best wayfinding experience. Indoor navigation is not just about replicating the ways and means by which outdoor navigation is achieved; instead it is about using the technology to improve, refine and personalise a greater wayfinding process. It is about identifying how people understand an environment in a more effective way, rather than forcing them to make sense of floor plans and diagrams which are often difficult to understand. Signes | Eyedog offers this technology, based on the best wayfinding applications. In order to stay at the cutting edge of scientific development, Signes | Eyedog collaborates with the Department of Geography at the University of Ghent in Belgium, led by Professor De Maeyer, professor of cartography and GIS (Geographic Information Systems). 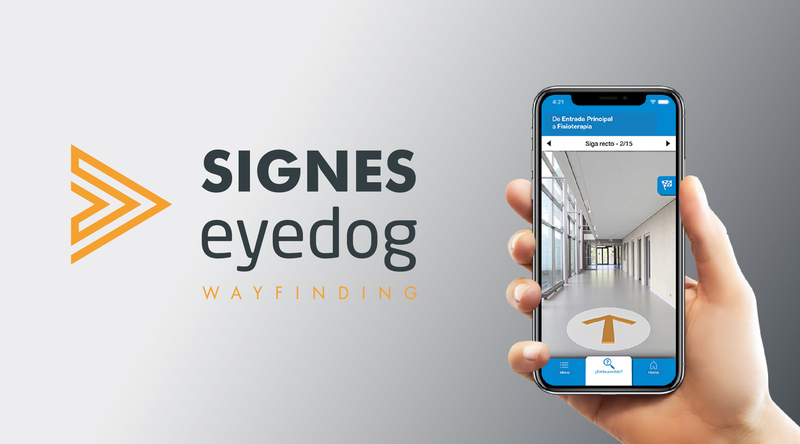 Signes engineering | Eyedog Indoor Navigation is a perfect combination of the disciplines of wayfinding, interactive design and mathematics.